During the last decades of the 21st century, humanity rebuilt after being nearly destroyed during an era of quantum-powered gods and monsters called Aberrants. In the first years of the 22nd century, the monsters returned, but humanity was now defended by powerful and heroic psions. Since that time, these psions and the organizations they work for have taken humanity to the stars, made contact with alien allies, and helped create powerful new technologies. However, Aberrants, hostile aliens and greedy, power-mad humans all remain threats that both psions and other daring humans must face. Trinity Continuum: Æon is the next edition of the game science fiction game Trinity, released in 1997. This new edition features mechanics that are both flexible and fast as well as psion powers that are both less rigid and more powerful. While the setting is quite similar to the original edition’s, it has been updated to reflect recent changes in our world and refined so that every location, both on Earth and out among the stars, can be an exciting venue for heroic roleplaying. If this sounds interesting to you, head over to our DriveThruRPG storefront to get Trinity 1st Edition. New edition coming soon! Æon merchandise is available via our RedBubble store. Now Available: Arms of the Chosen in print! 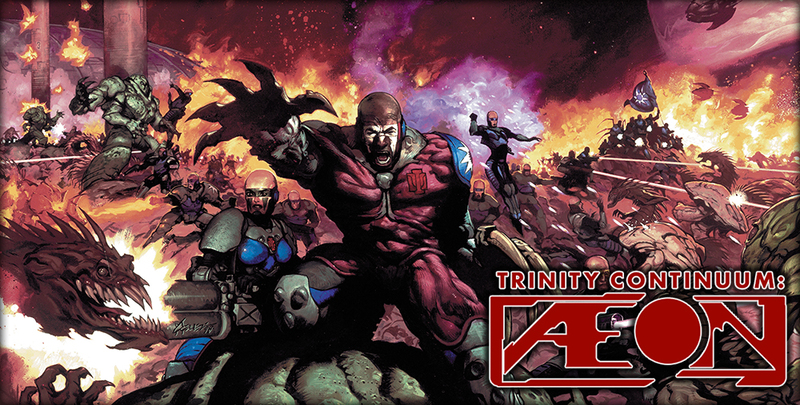 24 Hour Warning: The Trinity Continuum Kickstarter Launches!